WardheerNews has recently published a piece by one Guled Haji Hersi. Mr. Hersi attempted to share in his piece the bad news that the Federal Government in Somalia was in eminent danger of disintegration. To highlight his point, Mr. Hersi stated that the leaders of the Federal Member States severed ties and decided not to co-operate with the Federal Government. He also mentioned that the Upper House refused to join the Lower House where President Farmajo was to address members of the two houses. This is a sad and serious political setup. Every Somali should be concerned and spare no efforts to prevent our government from disintegrating. We need to learn from our past mistakes that resulted in killing of thousands of people and destruction of properties to the tune of billions dollars over the course of quarter of a century. So we do not need to go back there. We need to have dialogue, narrow our differences and sort out issues in the best interest of our nation. While this is the right thing to do, Mr. Hersi chose to point out that the solution to our political malaise lies elsewhere. It seems he is in a celebratory mood, rejoicing the political deadlock in Mogadishu. It is fair to say that Mr. Hersi wants to see situation getting out of hand, Farmajo ousted, and perhaps bloodshed in the streets of Mogadishu. Mr. Hersi intends to rock the boat, while the consequences of his actions may not affect him. Mr. Hersi mentioned a while back, in a different piece in WardheerNews, that he met Farmajo in the Dutch Capital. I assume he lives somewhere in Europe away from the harsh life of Mogadishu. In that piece, he stated that he met Farmajo twice. In the first meeting, he was like anyone else interested in seeing the president. In his own words, Mr. Hersi stayed there for less than half an hour, claiming that Farmajo’s speech lacked substance. He also mentioned that people in attendance were unemployed and recent immigrants and, I believe, he was implying that the other attendees had nothing to offer. Obviously, Mr. Hersi did not know those people very well. They could have been people from all walks of life. He just assumed they were unworthy people who had no ability to contribute to the meeting. And that is problematic when you find everybody, every cause, etc., unworthy and insignificant. Mr. Hersi used the words “unemployed,” “destitute,” “recent immigrants,” and so forth, to belittle and degrade those decent and patriotic Somalis. He was attempting to diminish their dignity and humanness by using such foul language that defines people in unpleasant way. He was disdainful of everyone, including the President. Apparently, hubris is at play here. Mr. Hersi was fortunate enough to be given a second opportunity to meet the President, and, in this meeting, he was part of a small group who were selected for the meeting. In my understanding, members of the group were chosen, based on their experiences and education level, with the expectations that they had the ability and willingness to have a meaningful discussion with the President. In such a discussion, people are always expected to be positive, civil, respectful, and above all productive to enrich each other’s experience in a way that will leave a lasting memory. Mr. Hersi wanted to play a different role in that meeting. His decision was to intimidate and humiliate the President. He bragged about asking the President what he called probing questions. He did this in such a manner that he intended to parade his education credentials and show off his prowess and knowledge in the field of economics. In a nutshell, Mr. Hersi’s purpose was to discredit and put the President on the spot.Since then, Mr. Hersi has maintained presence in the internet, trying to bully and discredit the President and his government. He is always raging, raving, and putting out there poorly written stuff with the quality of venomous hate letters. His writings are full of ill-feeling and also brimming with what can be categorized as personal grudge and animosity. It seems as if he leads a failing political party running out of options than blaming others for its failure. And his moment of truth arrived when he started cheering for the incompetent state leaders. 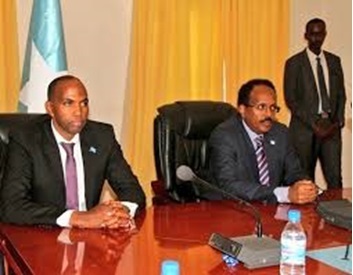 Abdiweli Gaas, Sharif Sakin, and Ahmed Madobe have not achieved any progress. Their respective states have regressed since they came to power. No economic, political or social progress attained. Mismanagement, nepotism, corruption and insecurity are the order of the day in their states. Donors have begun withdrawing their support for projects in Puntland. They have realized that there is no remedy to this rampant and shameless corruption, other than to suspend their involvement in these projects. These are vile issues dominant and obvious in their jurisdictions. Their claim that they need an agreement on how to share natural resource revenue is baseless and misguided. One may wonder what natural resource is at issue here. We have not been able to utilize our natural resources, notably minerals and petroleum. We can have discussion on these resources, and also study how other jurisdictions that have a similar form of governance have tackled these matters. This can be an on-going, long term engagement that has to be deliberated on thoroughly and honestly. Mr. Hersi has never been able to come up with useful ideas necessary for rebuilding our country. As an economist, he could have advised the government on sound economic policies by publishing essays that would highlight on ways to improve collecting taxes, to broaden the tax base and also to put in place prudent fiscal management strategies. Mr. Hersi could have done that either in private or public. He could have approached the government and offered his opinion on economic matters, or else could have gotten published, and in that way his written materials would have been available, useful to anyone interested. I would like to note that Mr. Hersi could understand neither his role as a citizen nor the role of the leader.As a citizen, he has a duty to contribute to rebuilding his country in honest and meaningful ways. I have already mentioned what Mr. Hersi’s duties, as a citizen, might have been, so no need to revisit that. Now, one may wonder what the role of a leader is. A leader is expected to energize and motivate his/her people by giving vision, direction and purpose. A leader has to demonstrate honesty, integrity and other good qualities necessary for effective leadership. And one has to be mindful of the fact that a leader, to be effective and successful, should enjoy the support of citizenry. So, the question arises: do we support our leaders? Do we maintain that support for the good of our nation? It is fair to say we don’t. To make sense out of this, see the magnitude of people who filled up on the streets of Mogadishu and other major cities in the country when President Abdiqasin Salad Hassan returned to Mogadishu following his election in Djibouti. There was enormous and spectacular demonstration of support for the president. What I saw on the television on that day made me believe that the worst had been behind us and that this was beginning of long-lasting, much needed reconciliation, peace and prosperity. My spirit was uplifted, and I became hopeful and confident instantly. Unfortunately, that was a short-lived fantasy. That has been the case for every president after Abdiqasin. They all have received warm welcome and great deal of support for the first few days. Then we go back to old habits of not doing much in respect to playing significant role in matters relating to the common good, including aiding the president and his government. Often times, we do not appreciate the fact our leaders are faced with lots hurdles and difficulties – insecurity, tribalism, poverty, as well as internal and external forces bending on perpetuating these difficult circumstances. Despite all these difficulties, Mr. Farmajo and his government are doing their best by dealing with one issue at a time. The government revenue has increased, investors are showing interest in the country, donors are satisfied with government performances which may lead to debt reduction and/or forgiveness. It is not an easy feat to qualify for debt forgiveness, but Farmajo and his government are close to achieving that rare honor. However, Mr. Hersi and ilk are trying to put all these gains in jeopardy. Their intentions are to paralyze everything and undo all that the success that we have achieved. So fellow, Somalis reject these guys and stand with the Federal Government of Somalia. – The disintegration of the Federal Government By Gulet H.
–The first year of President Farmaajo and Prime Minister Kheyre By Dr. Ahmed I.